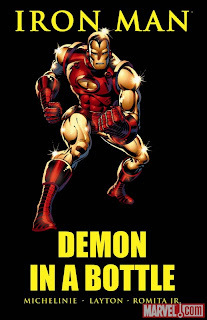 With Iron Man 3 coming out we figured it would be a great time to tell you all why this is an Iron Man must read especially if you're wanting more. Will we see Tony hit rock bottom in Iron Man 3? Who knows. Only time will tell. But I'm not here to speculate. I'm here to give you the facts and the facts are that Demon In A Bottle is a brilliant, awe-inspiring piece of literature. I don't believe I have ever read such an uplifting, inspirational, and realistic classic graphic novel in my life. 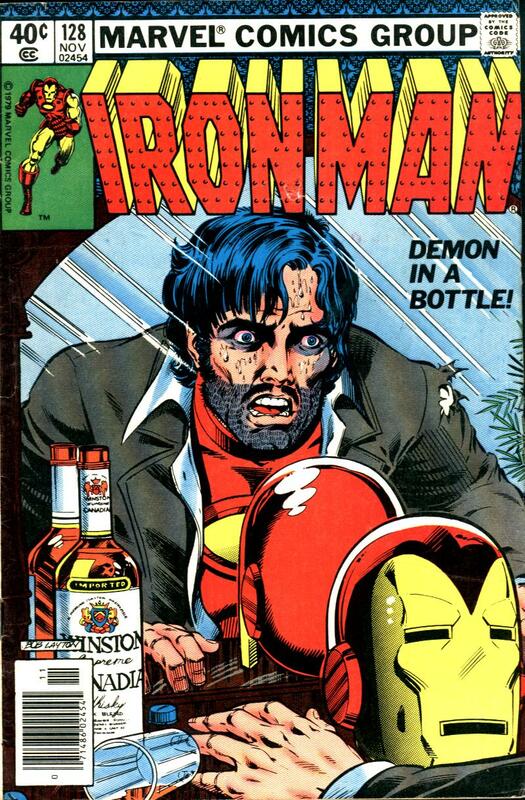 If you know nothing about Demon In A Bottle it is a story about Tony Stark and his downward spiral into alcoholism. Going into this book I thought it was going to be dated and forced. Boy was I wrong. The only thing that looked aged was Tony's wardrobe.This was some of the best art I'd ever seen with classic images and covers that you won't be soon to forget. It's art like this that is the reason I love the retro Iron Man armor the most. I assumed the alcoholism would be laid on pretty thick from start to finish but it was quite subtle for the most part until the end when it was most appropriate. Much like the Spider-Man stories of yesteryear this story is more about the man than the superhero. This book focuses on how all this real world stuff affects a real person with a little Iron Man thrown in. 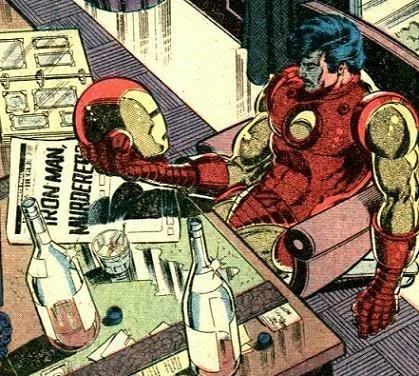 Tony is going through a lot of personal trouble and his "bodyguard" Iron Man is being used by one of Stark's business adversary's. on top of all his personal struggles he also has to clear Iron Mans name as himself. This is the creative team that put Tony Stark on the map as a real, true, interesting character. The art truly stands the test of time exceptionally well. 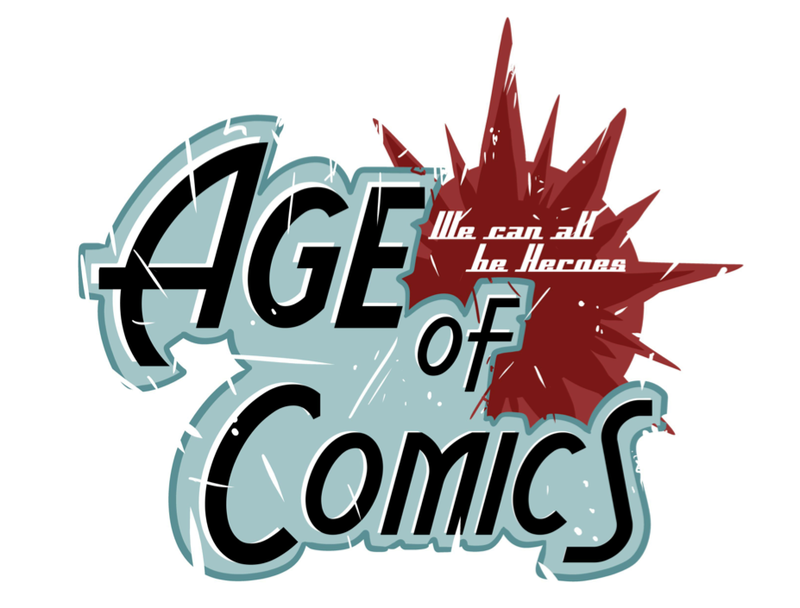 i would pit it against any other ongoing title right now for best art any day of the week. This book is wrought with iconic images that will stick with you forever. When it comes down to it though what truly makes this book shine is how inspiring it is. It sends a beautiful message that no matter how low you get there is always someone who is willing to help you with whatever you're going through. In this case it's addiction specifically alcohol. I swear if I ever become addicted to something that somebody will make me read this to inspire me to get the help I need. This was a huge turning point for Tony Stark and the Iron Man title that changed it forever. All of this and more is why it deserves to be the Trade of The Month. Some people my complain about his book being outdated by today's standards. I would argue other wise. This book alone has truly revolutionized comics for generations to come.The art is an older style, but it still looks great. The art still matches up against the art of today. I even like Stark's longer hair. I still have images stuck in my from looking at the art. If a book left images in my head the art did its job.The writing does have out dated late 70's cultural things, but they are easy to get and do not take away from the content.. The heart of the story and the complex plot is still intact. When I first read this series I thought the story was way to simple and to the point. That was the whole idea. The story just keeps building on top of itself. I felt the story was very realistic. The alcoholism was present throughout the whole book. I liked how it was gradually getting out of control. just like real life the alcoholism seems like a minor issue and is manageable. People did not care until he was already rock bottom and in a bad place. The problems Stark had was many problems building up overtime. Each issue adds more problems that make the situation more difficult. It is amazing how quickly things seemed to be crashing down towards the end. I would recommend the book for anyone who wants a good read that shows the effects alcohol out of control can have on the life of the person and others. Once I read this book I truly understood Stark more as a character.